Since becoming State Master I have returned to reading the Manual looking for parts that would reflect a better understanding into the Grange Ritual. At the close of the opening charge in the Installation Ceremony, the Installing Officer states “We ask none to join us who cannot see good in their fellow being, but to all interested in Agriculture, who have generous hearts and open hands to help the needy, raise the fallen and aid in making the labors of this life cheerful, we say “Welcome to the Grange”. As I reflect on this charge it reminds me of the Harmony in the Grange resolution from the 2014 State Grange Session, that was to be read at all Granges. We accept anyone and will work with everyone for the betterment of our Order. I have been forced to use Facebook to visit with people and help Hank type his activities. I was hesitant with this task, but have found it to be a great resource for getting the word out on what we do. Though I threaten to de-friend people for game type messages or funny videos, I find that Granges utilize their Facebook pages with functions and activities that put the Granges out in the news. Please read up on the messages sent out by the members and committees that put information out on Facebook, but beware of what you write because we want positive posts. We just finished the Northeast Leaders Conference, held in Portsmouth NH. Connecticut had a good showing of members. I found it interesting as a new State Master as to what is going on the Northeast region. 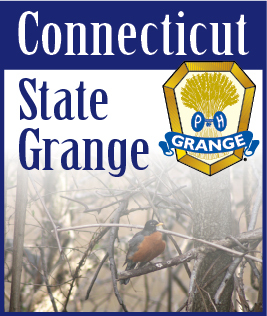 I am on the trustees of the New England Grange Building, member of the 2018 National Grange Convention committee, hosted in Rhode Island. Our committee members found interesting information for the upcoming year’s programs. So stay tuned for more on activities. This January has pelted us with frigid temperatures and rainy to sleet nights very little snow (knock on wood), so I hope we take into consideration our member’s safety on meeting nights. A shout out to Betty Jane Gardiner who slipped on the snow in her driveway when I brought her home from NE Leaders, after a great weekend we didn’t expect to spend 7hrs at Hartford Hospital ER for a bump on the head and three staples, but we are family and that’s what we do. Best wishes and speedy recovery. I am pleased to see the number of Winter Farmers Markets that are in our Grange Hall, what a great opportunity to get new members and visit with people and get our message out there. Keep up the good work and any other Granges looking for information on how they can do this contact those Granges, they are willing to help you get started. Happy Valentine Day and remember Presidents Day. Stay Warm.